Bedding is a crucial component of your hamster's environment. Bedding material provides a substrate for hamsters that's soft and comfortable yet firm enough to burrow in. A proper bedding material will absorb your hamster's urine and isn't prone to molding. While cedar is absobent, it can be downright toxic to your hammy. 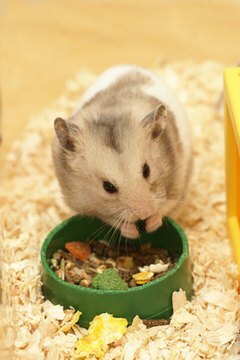 The most concerning reason for never putting cedar -- or pine -- shavings in your hamster's cage is risk from phenols. Cedar's phenols cause toxic fumes that can cause liver and respiratory problems in your little guy. When you open a bag of cedar shavings, you'll instantly notice the aroma. While it's pleasing to most people, the cause of the aroma is the problem. Phenols are the reason cedar is used to repel moths and other insects. The phenols in cedar and pine are toxic to all animals. Phenols cause an almost constant irritation to your furry friend's nasal passages and eyes; it can lead to growth of bacteria due to the weakness. Bacterial infections can lead to fatal pneumonia. The kidneys and liver, which work to filter toxins from the body, are affected, too; the exposure to phenols works the liver and kidneys to the point of failure. Liver and kidney damage also causes a weakened immune system and other problems. While phenols are the primary reason to avoid using cedar shavings, one more is prevalent. Cedar is a rough bedding; the shaved chips can splinter, which is uncomfortable for your hammy. The splintered edges can cause small and large lacerations. It's also tough to digest, which is not good for small animals that may chew on them. Unfortunately, cedar and pine shavings are common in pet supply stores for animals of all types. They're among the least expensive options, a major deciding factor for many households. Other options are plentiful, however, so you can easily find a suitable bedding material. Compressed wood pulp bedding is among the best, but aspen shavings, recycled paper, corncob bedding and others are better choices than ceder. When using pelleted or corncob bedding, change it frequently because they can mold more quickly than others. If you choose recycled paper, use only bedding that is made from paper that uses vegetable-based inks. American Fancy Rat and Mouse Association: Cedar and Pine Shavings Are Toxic to ALL Small Animals!